Galatzó – Puntal del Tamborero | 260 km. One hicking for to see a sunset from one summit of Mallorca turned into a contemplation of distant horizons beyond the line of the sea. In Aragón, far away of Valencia region… May be the first image from these part of Spain from the island. The pictures I made on the 8th of August around 21:00 Hrs on top of Galatzó peak where I got to make a bivouac and enjoy the sunset and sunrise on Tuesday. A few days ago I had a lot of north wind blowing so the atmosphere was very clean pollution. Once above it would be a good harvest sunset because the horizon looked very clear, as well as we see with total clarity Ibiza. Suddenly, to hide the sun we started to see how the outlined mountains perfectly defined, which, at first with great excitement, we thought it could be near of Valencia or Castelló position because it could not be another thing that the peninsula. Suddenly I took the machine, a bridge camera Olympus brand, model SP 590 UZ, a good machine for fans but unpretentious, but equipped with good optics and a large focal length (26-520 mm). I puted zoom to the maximum with the intention that it confirmed the peninsula altough I was not very sure about the quality of the final picture. Interessant surprise then analizing the silhuettes. Proceeding to the identification of the reliefs with the help of simulator of Ulrich and analyzing the azimuth of the sun for that day to better check the consistency of photography, it was a pleasantly surprise. A pair of peaks of the community of Aragon. It’s a remarcable aspecte because possibly it’s the first reported images of mountains located in Aragón territory covered from the Balearic Islands. The unusual transparency that day, the favorable position of the sun and high atmospheric refraction were important factors that contributed to it. In the images we see a “hat” on top of two mountains, it’s like a lenticular cloud but that day it was not conditions for these clouds. I believe that it was a superior mirage caused by atmospheric refraction. Refraction produces ocasionally this illusion (only occurs in strong gradients investment) but independently of such effects always raises the silhouettes of distant landscapes. Without any influence by refraction also would have seen the peaks but in that case only the peaks tearing the surface; the phenomenon allows those mountains to be seen with good size and moreover perceive the intermediate zone of aparent union between them, at 1500 m high aproximately. 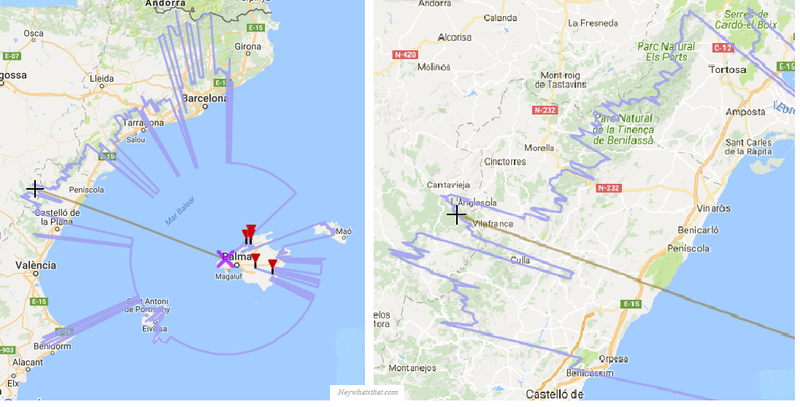 In the illustration above here we can see reliefs attached diagram obtained through the simulator HeyWhatsThat and in the below a radial mapping with the potential scope of visibility from the Pic Galatzó, also obtained from the same web. Also, by the other hand we can show the link to Ulrich Deuschle simulation for the case. Tamborero name it’s in google maps, not the other. The name of Moleta del Tosal (255 km) has been determined after checking the coordinates of that point and searching it on topographic map of the IGN. 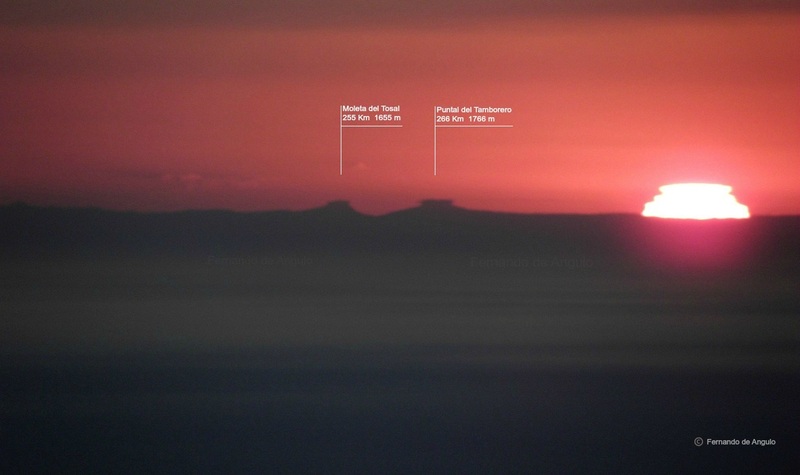 Peak Tamborero and his neighbor are in the province of Teruel, in the Iberian range (Sistema Ibérico in spanish). Detail of positions of these summits in topography maps. < Previous Pic de Finestrelles – Pic Gaspard / Ecrins | 443 km. Next > Mt. Argentario – Mt. Rotondo | 170 km. Bastiments – Alps and Mont Ventoux | 436 km. Canigó – Barre des Écrins | 412 km. Pic de Finestrelles – Pic Gaspard / Ecrins | 443 km. Get one for your own!